I have a sneaky suspicion that my email exchange with him will be equally fruitless. I also don't understand why someone would be happy putting their name to this kind of nonsense. On the other hand, he apparently made £3000, is already a Professor, and academia has a habit of forgetting, or ignoring, people's transgressions. If Terence Mills changes his mind, I would love to make the same bet with him. Yeah, £3k, that's pitiful. Isn't his reputation worth more than that to him? Is that really how cheaply he sells himself? IIRC the Not the IPCC crowd were offering something rather larger a few years ago. Not that I really do recall in detail. Mills said he was near retirement, what a great highlight to bow out on. Not being willing to comment on the credibility of your own forecast is rather worse than admitting it has no credibility. My impression when I read the report was that Mills intended it as some kind of introductory tutorial, in order to encourage climate scientists to explore a kind of models which had been successful in economy. Of course, it would have been more useful if he had explained how one can incorporate forcing, but that is only briefly discuss and then dismissed in the last section. If he had done so, that might at least have had the potential to (a) include some physical realism, and (2) make it useful for predicting the effects of different policies. But then the report was spun and twisted by McKitrick first in the foreword and then in the GWPF announcement, and things reached absurd proportions when the press wrote about it. The well has now been thoroughly poisoned. I still think, though, that we should at least entertain the possibility that Mills was cynically taken advantage of by the GWPF. Well, that was partly the point of my emailing him, but he made no effort whatsoever to distance himself from how they and the Times have spun it. Let's give him some more time. It must be painful to admit to oneself (and others) that ones reputation has just taken a nose dive because of ones own naivete. I emailed Terence Mills too. I think what Lars said has some merit in that he did suggest that there was a media misunderstanding and that the goal was to present statistical forecasting to the non-statistician. On the other hand, actually presenting forecasts using models with no physics whatsoever, suggests a somewhat poor understanding of the basics, which is a little odd given that he published this. Nope. I'd be delighted if he did come out with a clear statement to the effect that he never meant his analysis to be used as a real forecast, and that the press have misrepresented him. But he hasn't. It's like Bengtsson all over again. Except this time even Richard Tol has been trashing his work on your thread ATTP. Mills won't get a free pass from me to talk to two different audiences through different sides of his face. He can't pretend to academic audiences that it's just a bit of mathematical flim-flam and then present it to the press as a real prediction. If the GWPF has misrepresented him, he should grow a pair of balls and say so. Have they really bought his acquiescence for a paltry £3000? At the moment, he just looks like a pretty rubbish shill, prepared to write nonsense for such a meagre fee, and not even able to get it through peer review. I'd be delighted too if he came out with some kind of clear statement that he's been represented. In fact, I would regard it is somewhat impressive if he did. I was being a bit soft. I agree that he shouldn't make what sound like reasonable argument to other academics in private, and then ignore that it's being presented as something real by the GWPF and in the media. One thing clear to me, as I tried to replicate with a similar though apparently not identical ARIMA(4,0,0) regression model, is how much the slope in each segment depends on the operator's choice of arbitrary start and end points. 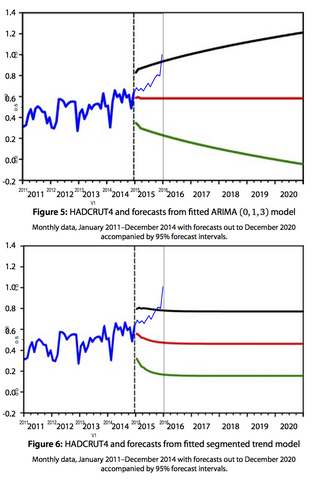 For example with HadCRUT4 if I choose 2001 or 2000 instead of Mills' 2002 to start the final "regime," the slope and hence forecasts become noticeably steeper. Just a thought - does this whole exercise not tell us a hell of a lot more about Economics than it tells us about any science? Well it tells us most directly about Mills and the GWPF of course. But to some extent, it reflects rather poorly on academia in general. For gods sake, I just compared the forecasts in the report (PDF) to the one shown in the Times piece (reprinted on the GWPF web site). The former go to the end of 2020, whereas the latter is extended all the way to 2100! Mills has to take a stand against this downright fraudulent misrepresentation of his findings! But to some extent, it reflects rather poorly on academia in general. Academic freedom does give people the right to do some stupid things, so I'm unclear how one could stop someone from doing what Mills has done. The only thing I can think of is other academics making it clear that what he's done is garbage, but even that's hard because - as a fraction of all academics - the number who understand this is probably small. I guess I was rather disappointed when Loughborough University PR promoted this on Twitter, but they did delete it after I pointed out that it was essentially science denial (admittedly this was partly because they linked to the Twitter account for the wrong department, but they don't seem to have retweeted it). So, in what sense do you see this as reflecting on academia in general? Oh, I just meant in the way that it supports the meme of ivory-tower intellectual game playing (not so intellectual in this case) with no regard for real world consequences. I concede it's not a big deal but it's not a positive contribution. It may be his right to do stupid things but that doesn't mean it's an obligation! Oh, I just meant in the way that it supports the meme of ivory-tower intellectual game playing (not so intellectual in this case) with no regard for real world consequences. I guess I hadn't thought of it this way. My impression is that it's more partisan journalists and organisations like the GWPF who like to do "Professor says....". Of course some academics play up to this, but it's my impression that this isn't the norm. I think most would try to be careful about clarifying the motivation behind their work. It may be his right to do stupid things but that doesn't mean it's an obligation! Agree completely. I wasn't defending people doing stupid things (I think everyone is open to criticism) I was just defending it reflecting on academia in general. "... Numerous studies have failed to unearth a significant positive correlation between past relative performance and future relative performance. The only correlation found has been the consistency of managers with very bad returns to continue to post bad returns in the future...."
Face it, guys like Mills sweeten their salaries by "consulting". The article was an excellent career move. "he should grow a pair of balls and say so"
Perhaps he can borrow some from Hobbes. The stuffed tiger or the philosopher? Been skimming the cat posts, eh? Ginger (no) Nuts' official name is Hobbes. Alas poor Hobbes, he is no more, snatched away from us in his prime. He is now in a far far better place. A farm with space to explore and rabbits to hunt, to be precise. A week ago I wrote here that I reserve judgement about Mill's guilt until he has had sufficient time to respond to the misrepresentation of his report by the GWPF and some media. He has still not responded, so now it is justified to conclude that he was a willing accomplice to this scam.